Be the first to share your favorite memory, photo or story of Loretha. This memorial page is dedicated for family, friends and future generations to celebrate the life of their loved one. 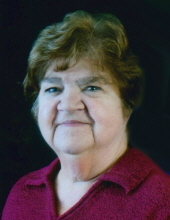 Mrs. Loretha Sue Meadows Almond, age 76 of North Wilkesboro, passed away Tuesday, February 5, 2019 at her home. Funeral services will be held 2:00 PM Friday at Baptist Home Baptist Church with Rev. David Jones, Rev. Mark O. Hollar and Rev. Jeff Blackburn officiating. Burial will be in the church cemetery. The family will receive friends from 6:00 PM until 8:00 PM Thursday evening at Reins Sturdivant Funeral Home. Mrs. Almond was born May 26, 1942 in Raleigh County, WV to Lacy Albert Meadows, Sr. and Rosa Pearl Manning Meadows. She was retired from Baptist Home Baptist Church where she served as the Church Secretary for many years. Mrs. Almond was a member of Baptist Home Baptist Church. She was preceded in death by her parents and her husband of 57 years, Michael Arthur Almond. Mrs. Almond is survived by two daughters; Lori Almond Miller and husband Shannon of North Wilkesboro, Alecia Almond Prevette and husband Jason of Wilkesboro, a son; Timothy Michael Almond and wife Rita of North Wilkesboro, six grandchildren; Arynn M. Anderson and husband Shaun, Earl Johnson, Jr., Lacy S. Greene and husband Jarrett, Jenna M. Walker and husband Josh, Jared M. Story and wife Laken and Graylen M. Mitchell, four great grandchildren; Mason and Trent Walker, EmberLynn Greene and Zolie Anderson, a sister; Drema Brooks of Florida and two brothers; Lacy Albert Meadows, Jr. and wife Patricia of Ronda and Dr. Richard Meadows and wife Emily of Beckley, WV. Flowers will be accepted or memorials may be made to Wake Forest Care at Home Hospice 126 Executive Drive Suite #110 Wilkesboro, NC 28697. To send flowers or a remembrance gift to the family of Loretha Sue Meadows Almond, please visit our Tribute Store. "Email Address" would like to share the life celebration of Loretha Sue Meadows Almond. Click on the "link" to go to share a favorite memory or leave a condolence message for the family.